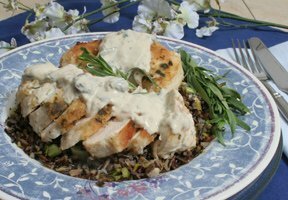 Make ordinary chicken breasts a special treat with this flavorful recipe idea: tender chicken breasts pan-fried in a tarragon, garlic oil; served on a bed of wild rice; and smothered in a rich mushroom, tarragon, and shallot sauce. Fantastic! Everything you need to know about asparagus: how to store; how to clean and prepare; and many methods for cooking. Step-by-step instructions on cleaning and preparing whole artichokes for cooking.